It seems that 2016 shall be known as the year of the good gluten free ice cream, although this may be mostly due to me personally eating a lot more of it this summer. 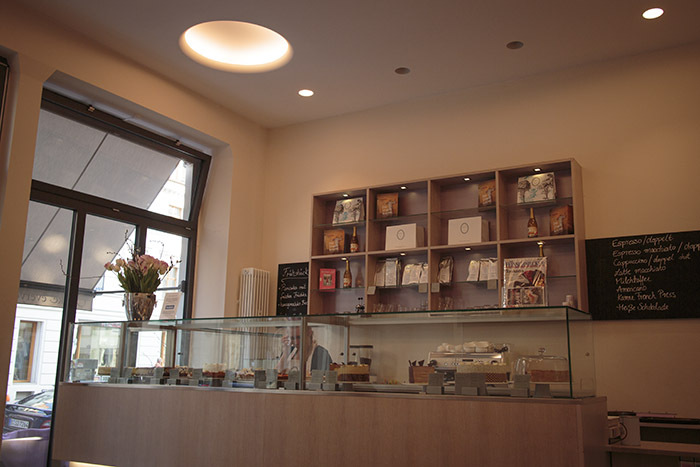 But there are a few new standouts and Oak and Ice on Schönhauser Allee is definitely one of them with a much higher quality of ice cream than usual. First off, the place is gorgeous and around 5000 times better that other ice cream places in terms of seating and comfort. I’d actually go far as to say it’s more of a cafe than an ice cream parlour. They have a pretty great selection of ice creams, although at the moment they’ve stopped labelling which are gluten free. I’m not sure why they’ve done this, but they do say that their sorbets are all gluten free but only after asking will you be told that the other ice creams are all gluten free apart from one (the oreo cookie one on my visits). This is a little worrying as you’re completely relying on the staff behind the counter to really know what they’re doing and as we’ve mentioned before, most people do not. Add to this that almost every time I have been, I’ve asked if the ice cream is gluten free, ordered and then been offered the ice cream in a cone. Suffice to say a little labelling and staff training would go a long long way here. To be honest though, I wouldn’t be giving them a hard time if they were not offering things like this. Yes, the signs are somewhat hard to read, but that’s a gluten free ice cream sandwich written right there. So, on my first visit, I ordered one, because what else would you do? Honestly, it wasn’t that great. The cookies are from Jute Backerei next door and they’re good as British style biscuits but not really the american chewy cookie that you need for an ice cream sandwich. They’re just very very dense. 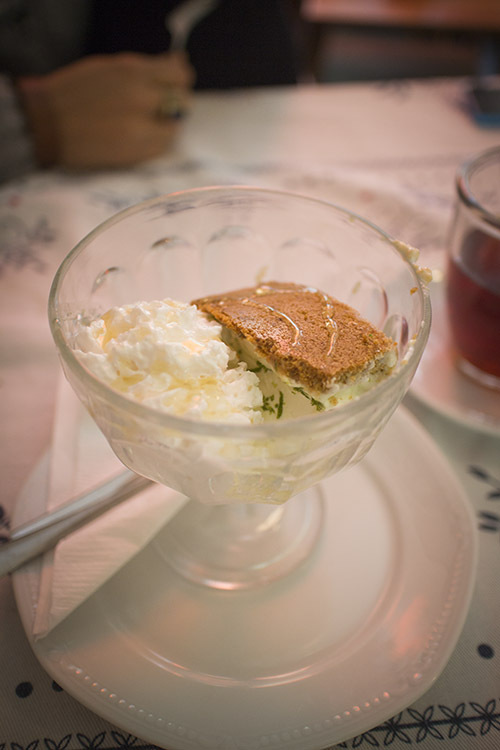 But, on the bright side, the Marscapone and Fig ice cream within was absolutely amazing. Not to mention the salted caramel varieties (they are ridiculously good). Even their plain ol’ regular boring just vanilla is out of this world. They do have a cake selection too, but I’ve only seen one or two gluten free options there. 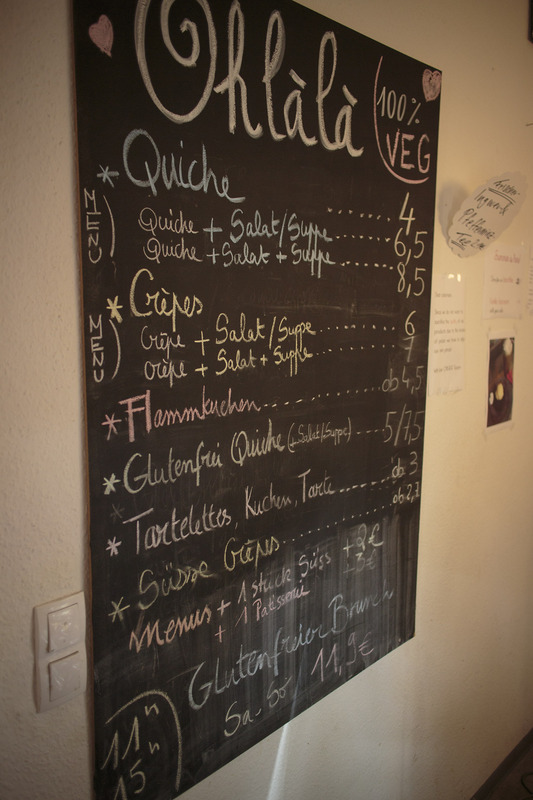 All of the cake options I’ve seen are from Jute Backerei also. In conclusion, definitely go and visit, their ice cream is simply the best I’ve had in the entire city. But be careful, double check and ask them to cater more to gluten free people. Ice Cream is one of those things that confuses many my non-gluten free friends. They often react with complete bemusement that such a creamy tasty thing could have wheat in it. Which, to be fair, is a pretty good reaction, why on earth should it? So, here in Berlin you run in to the usual Berlin problem. There are plenty of places with ice cream here but the majority of the time you have to rely on the staff if knowing if there is any gluten within. This often results in a response of ‘of course not!’ and then you have to judge yourself whether the staff actually knows what they’re taking about or whether they’re like most people and simply don’t understand. Fortunately there are a few places that actually put little gluten free symbols on their labels, removing the need to try to and be a psychic. 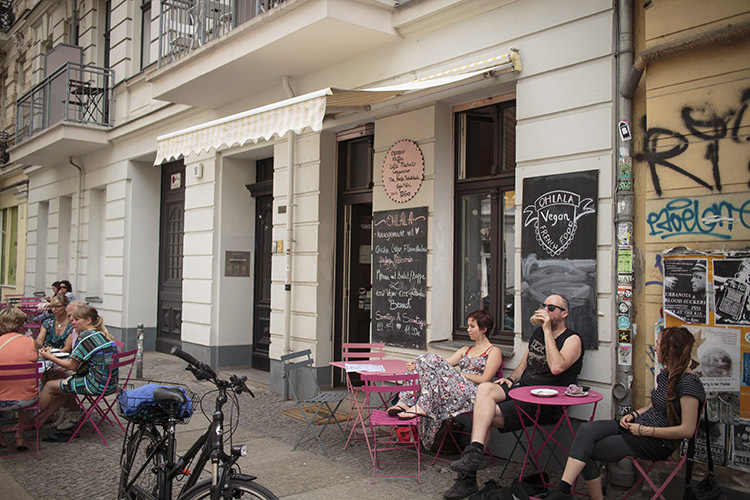 Today we’re talking about Gelateria Mos Eisley, a little place in Schillerkeiz, Neukolln. First, I’d like to point out the sheer genius in their name. I think I have visited more times than usual just because of it. If you need me to explain it, then the joy of it will likely be lost on you. The place itself is quiet small but they do have a few seats inside and out, otherwise it’s a pretty standard ice cream place. Their selection is usually pretty great and I have yet to be disappointed. But the main joy is this little collection of symbols. It just makes life much much easier. Although, as with all ice cream places here, they tend to not think twice about using the same scoop for all ice creams, so there is a pretty good chance of cross contamination. In conclusion, their ice cream is pretty great and well worth the visit. 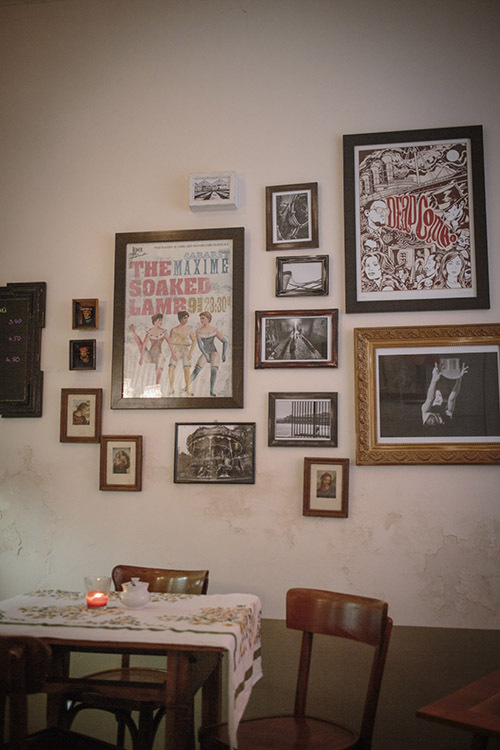 Plus you can go for a little walk to the amazing Tempelhof Park after your purchase. The Berlin of 2016 is thankfully quite different to the Berlin of 2009 that I moved to. 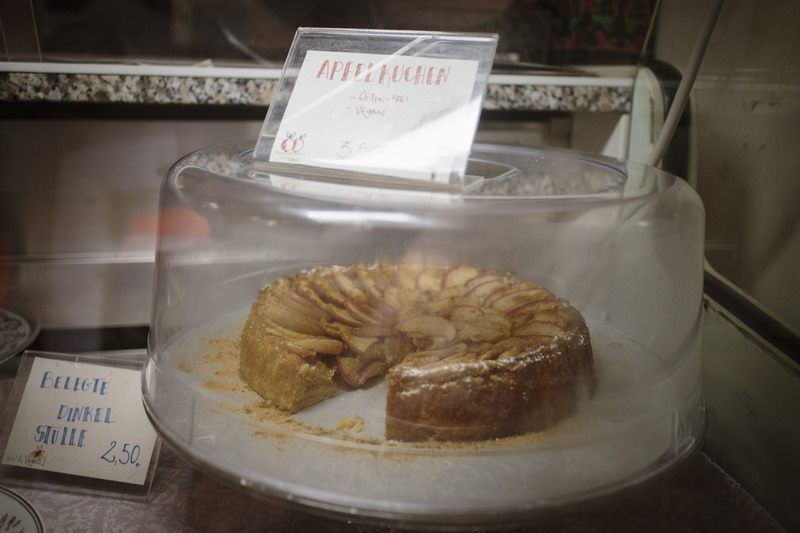 Back then you were lucky if you could find a lone slice of gluten free cake anywhere in the city and people were very proud to tell you that there was no MSG in their food when you asked about gluten. But, this new state of affairs is not without it’s problems. Gluten Free has become so popular that many places are now offering it, with not all of them being quite sure what gluten free actually is. The idea that you just change out regular bread for gluten free bread and everything is spiffy is quite prevalent and people are quite shocked that things such as mustard and soy sauce can have gluten in them. Today, I’m reviewing Charlies Asian Bakery in Kruezberg. They are thankfully a little bit in the middle of these two extremes and advertise themselves as a gluten free place. 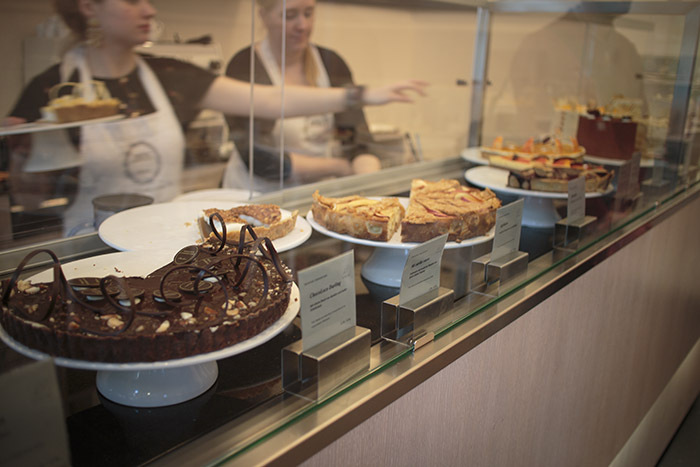 They do seem to be quite knowledgeable about it and have a pretty good range of gluten free meals and cakes. But there was a small problem, more on that later. First off, the place itself is lovely. All that Berlin decor of old furniture, warm lights and comfort, perfect. When you walk in, you’ll be presented with this display on the counter. Lots of gluten free! Then you might notice this menu. Even more gluten free! Then if you take a look over at the cake display cake, you may pop. So much choice! So, you may be wondering. 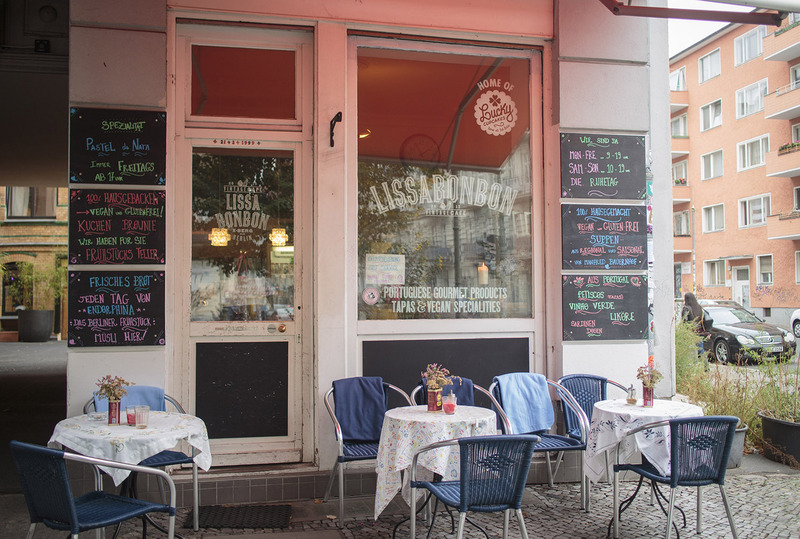 What was with my rant on the state of gluten free here in Berlin all about? Well, I decided to order the Banh Bao and look what arrived. Yes, that does look amazing, you are correct, it was delicious. The problem was that little dish in the top right. Soy Sauce and not of the gluten free variety. Now, even though the rice bun is advertised as being gluten free and that I asked for a gluten free rice bun, it still arrived with the soy sauce. I only avoided eating it as I double checked (always, always, always double check). If this was a meal that you could specify to be gluten free as an option, I could understand, but it is specifically being sold as gluten free. The staff were helpful enough to check on both of the sauces for me, but still, it’s rather worrying. Plus, there’s the fact that they could spend an extra 50 cents and buy gluten free soy sauce and only use that in the whole place. But what can you do. Now, the complaining over. It could, after all, have been a simple mistake or lack of training of their staff. The food itself was actually pretty great and I have been a few times now and never suffered a reaction. Plus, the cakes, oh my, the cakes are simply amazing. 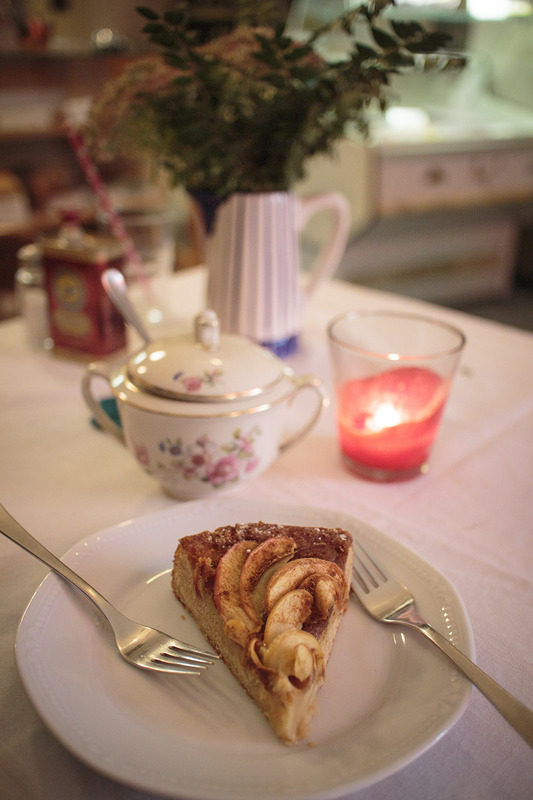 This is perhaps my new favourite gluten free cake in Berlin. This was was pretty awesome too. There is absolutely nothing to complain about in the cake department. Plus, they have some rather good drinks from ManuTeeFaktur there. In conclusion, should you go? Yes, they may have made a mistake, but this is par for the course in Berlin these days and we all have to be vigilant. I’m pretty sure they will improve when more of us visit and point these things out. The food is well worth the trip and any hassles. If there’s one thing that makes life easy for a blogger, especially one who writes reviews of cafes and restaurants, it’s when you have a gorgeous looking cafe. With lots of little nicknacks, textures, antique furniture and good lighting. Just pointing the camera in any random direction makes a great photo. Easy. Add into that amazing food and my life is almost complete. But, just look at Lissabonbon. I mean, what more could you want? 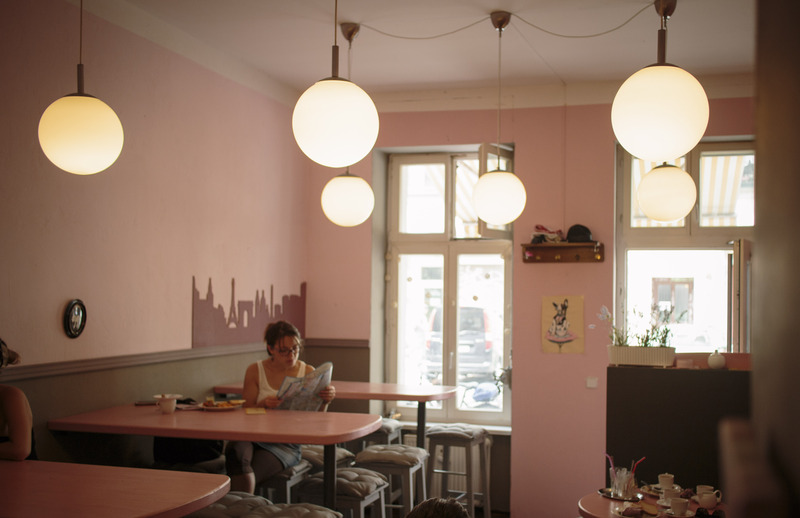 The place is a fairly small cafe, just south of Görlitzer Park in Kreuzberg. Yes, it is a little bit of a walk from the nearest U-Bahn station (Görlitzer Bahnhof or Schlesisches Tor), but it’s well worth it and I’ve heard that there are these things called buses too. There are only around 10 seats inside, but if it is summer, there are plenty more outside. Back inside though, there is plenty of food to be had. On first sight you may think there’s gluten free bread tucked behind some glass in a nice display, but, at the moment there is unfortunately not. Just your regular gluten filled bread. Although the owner (who is delightful and you should spend some of your time chatting to) is planning on making her own gluten free bread. If you’d like this, go, often, buy all you can and let her know how much you’d love it (and her) if she made some. But, let’s get to the food itself, this is what we are here for after all. That’s right, sandwiches AND cake! All of the sandwiches are individually wrapped to help avoid cross contamination. I’ve been a few times and there has been a different cake on each visit. 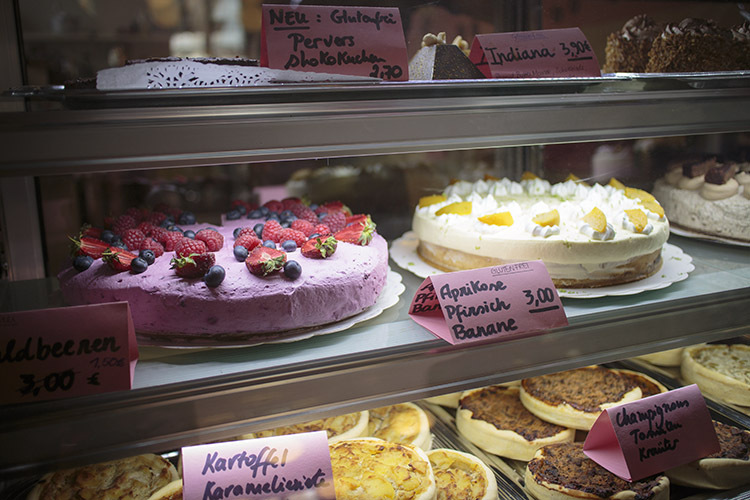 Which is a welcome change, too many places here just bake the same gluten free cake again and again. 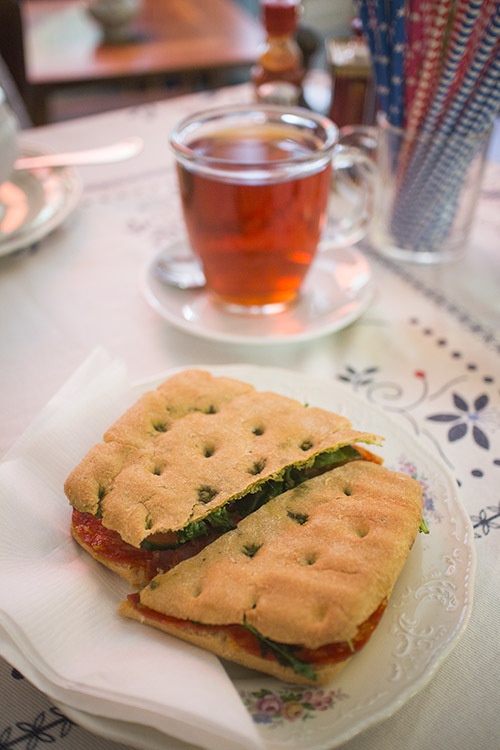 The sandwiches come heated and rather delicious. 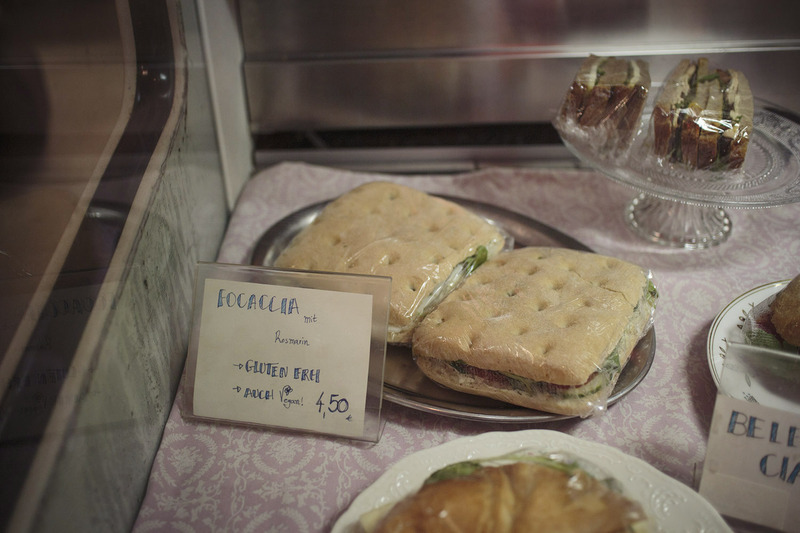 The schaer foccacia bread isn’t absolutely amazing, but it’s also not bad. Just regular. Delicious! 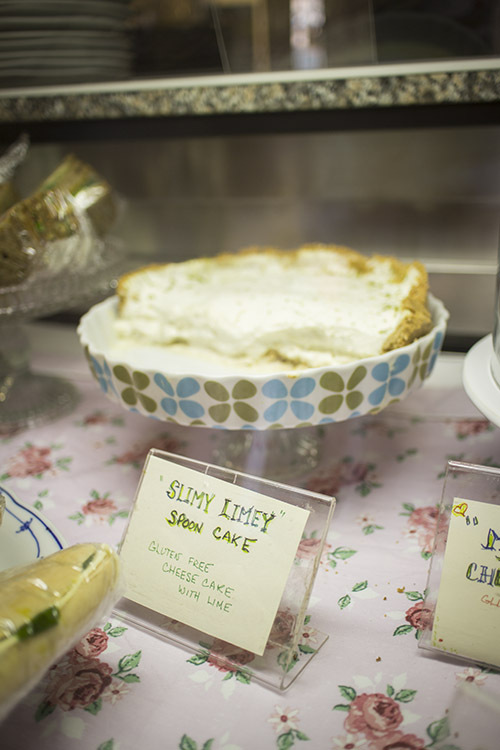 The Slimey Limey cake, which absolutely had to be eaten with a name like that, came with whipped cream and lime sauce. To say it was amazing would be an understatement. Yes. Go, hope that they have this, then stuff your face. 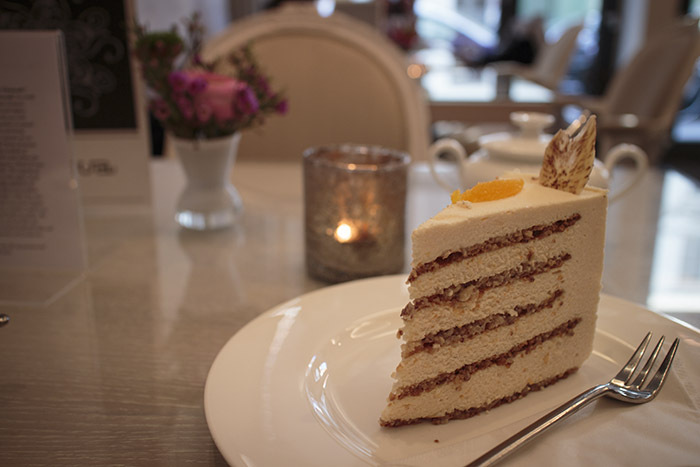 If not, their other cakes are also rather good, and certainly not a consolation prize. They also have amazing soups (which I ate too quickly to take a photo of) and tapas with plenty of gluten free options (which I haven’t had a chance to try just yet). In conclusion, they’re really trying to provide a good experience for those of us gluten afflicted. 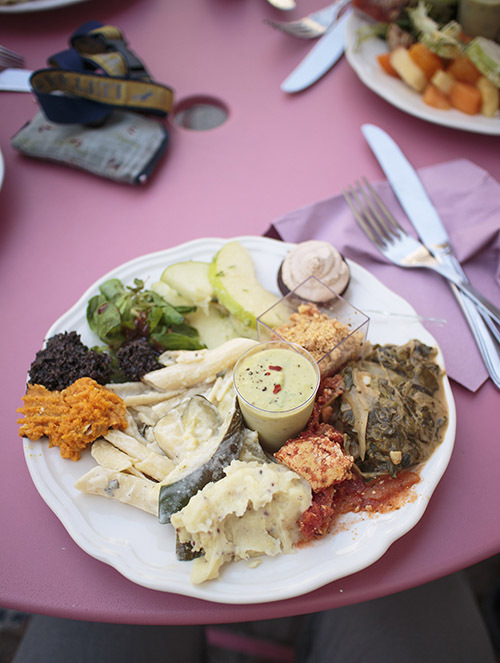 A fairly varied selection of dishes which are different than what you can get in most other places. And, hopefully, with your support of them, they’ll start to offer more and more. Yes, you should definitely make your way there and eat as much as you possibly can. 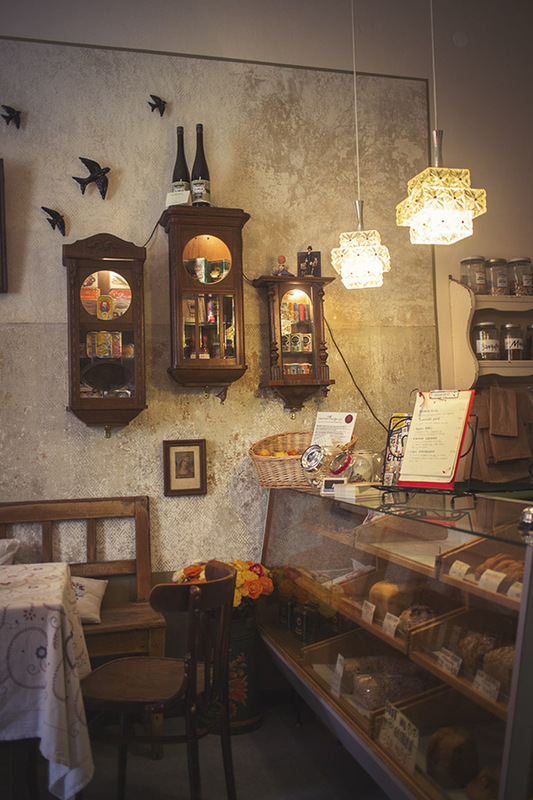 I sometimes have quite a mix of emotions in my brainbox when it comes to finding new gluten free places. 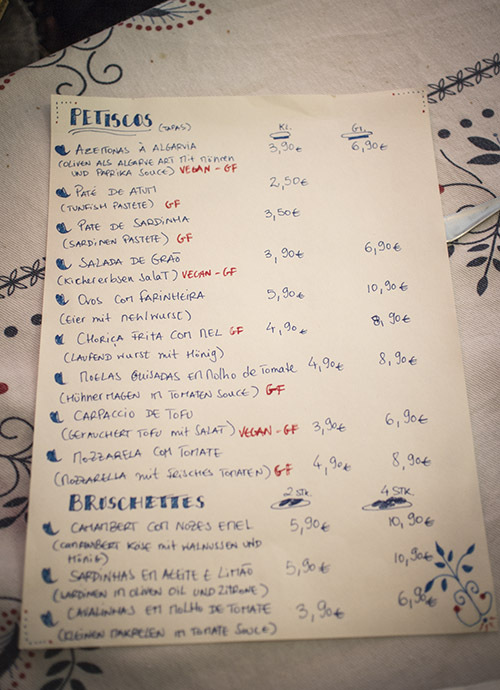 I’ll be walking around the streets, as I’m oft to do, looking at all the menus in the cafes and restaurants. Just waiting and wishing to see a glimpse of the magic word, “Glutenfrei”. Although, this is mostly a fruitless exercise, even with things improving in Berlin. 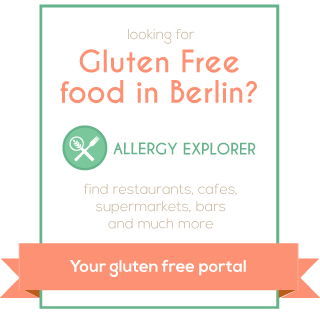 I simply already know most of the gluten free places in the city. But occasionally, very rarely, I’ll find one. This is just how I stumbled upon Feinkost Fraktion one day, pure blind luck. This now leads me to the aforementioned emotional maelstrom. I am extremely happy on one side, “Wow, a new place! !”, but on the other side I’m annoyed that I haven’t found the place earlier. Especially when that place is amazing and within walking distance of my apartment, plus it has probably been there for months without my knowledge. This is something I am hoping to fix with Allergy Explorer soon, but we’re not quite there yet. So, I’m left with extreme happiness tinged with lots of annoyance and frustration. But, enough waffling about the inside of my head. You’re here to read about what food you can stuff into your face. Well, take a look at this. It’s what first grabbed my attention. Inside, things get better, just take a look at these menus. Lots of glutenfrei’s all over the place! Plus, pretty normal prices! A definite surprise in the world of vegan and gluten free food. 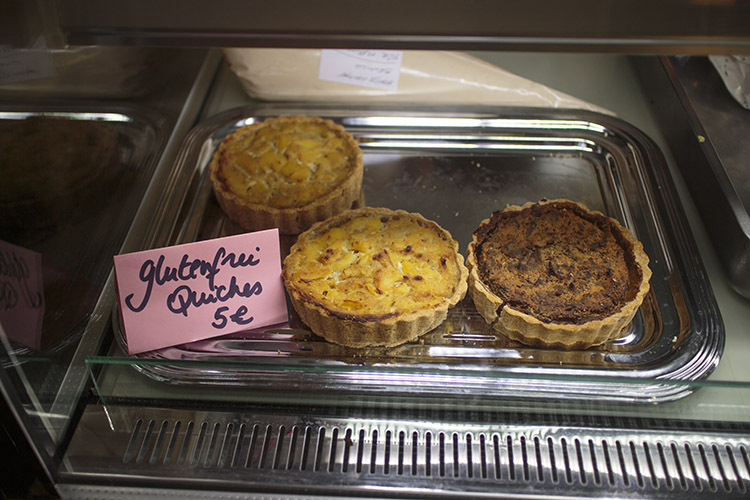 I have visited a few times now and I’m sad to say that they don’t always have everything in (I’ve yet to sample their quiche), but to be fair, they’re probably not getting a huge amount of gluten free traffic yet (fix this by going there now and telling them how much you love them and their gluten free food) (well, after reading the rest of the review of course). Inside it’s kind of a combination shop/cafe with only ten seats at the time of writing this (plus a few outside if it’s warm enough). 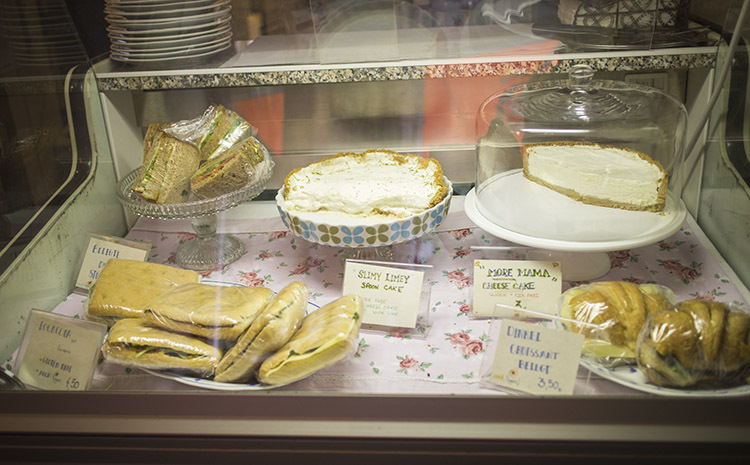 The shop (and the cafe to be fair) is mostly focussed on Vegan food, so don’t expect to find a huge amount of gluten free products to buy. But, do expect to buy a lot of food. Just look at it. Yum! Now, you’re obliviously thinking ‘oh my, that looks rather good’, well, it’s even better than you’re currently thinking it is. Plus, cake, of course. Happiness. The only downside is that they are still learning the art of gluten free. For example, I’ll often be served a non-gluten free biscotti type thing with my tea, even though everything I ordered was gluten free (to be fair, this does happen a lot here in Berlin). I’ve asked about their kitchen safety and I have been assured that they do their best to avoid cross contamination, although it was one of those conversations that you get in Germany, where you get the impression that the person you’re speaking to doesn’t really understand the seriousness of what you’re asking. So, if you’re a celiac or have a very sensitive intolerance, I’d recommend having a conversation with them first and stressing the importance of avoiding cross contamination. Although, I should point out that I have never had any reaction there, not even a slight one, and I’m definitely on the more sensitive side. I’d expect this to improve with time, the staff/owners are very friendly and nice and I believe they genuinely want to provide good gluten free food that is safe for us all to eat. In conclusion. 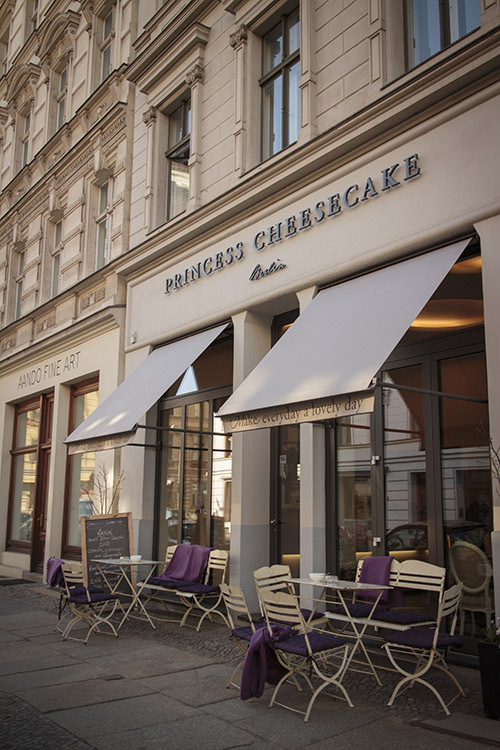 This is perhaps my favourite gluten free place in Berlin at the moment (pushing Suzette to a close second place, but only due to their lovely cheese and my lactose intolerance). 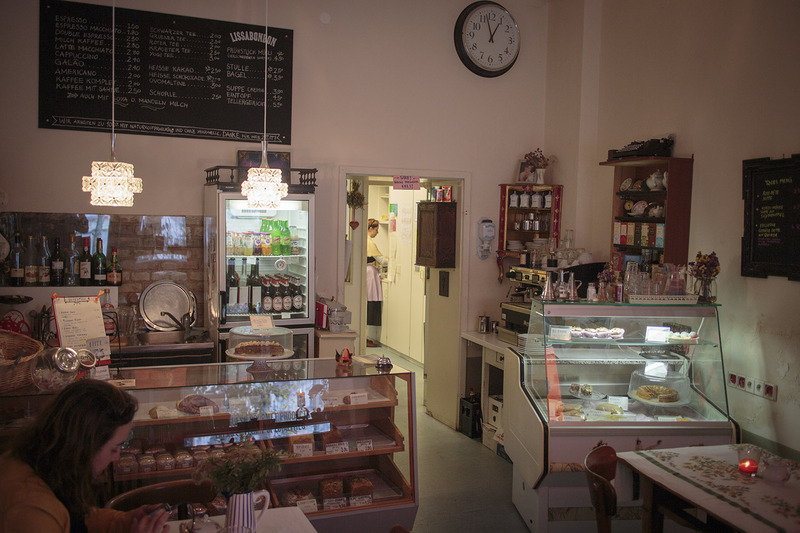 Their food is fresh, very good and reasonably priced and you have a large selection of varied dishes you can order. 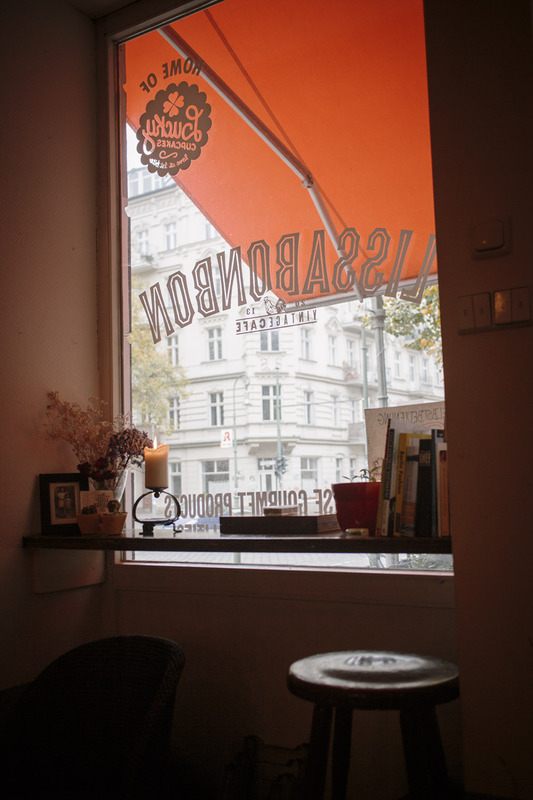 There are not many places you can say that about in Berlin. GO and visit NOW! 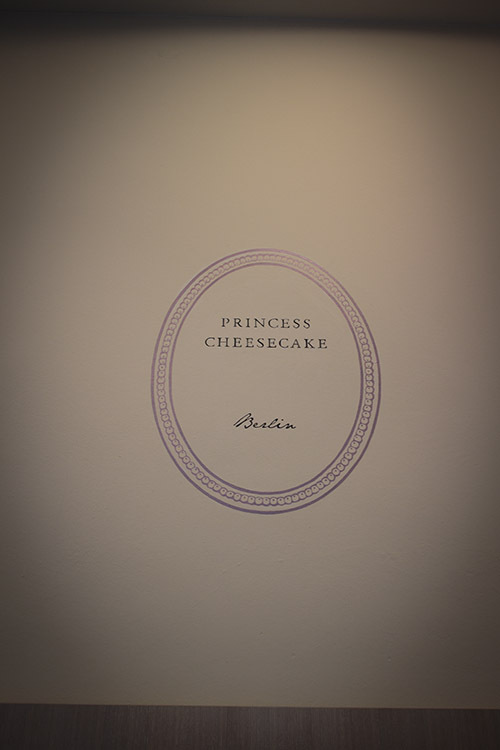 When I heard that the cafe ‘Princess Cheesecake’ was offering Gluten Free treats I giggled like a little school girl. I am going to eat Gluten Free Cheesecake!!! Amazing news. Yes, it is one of the easier cakes to make gluten free, but it’s also a freaking Cheesecake. I rushed down there immediately. 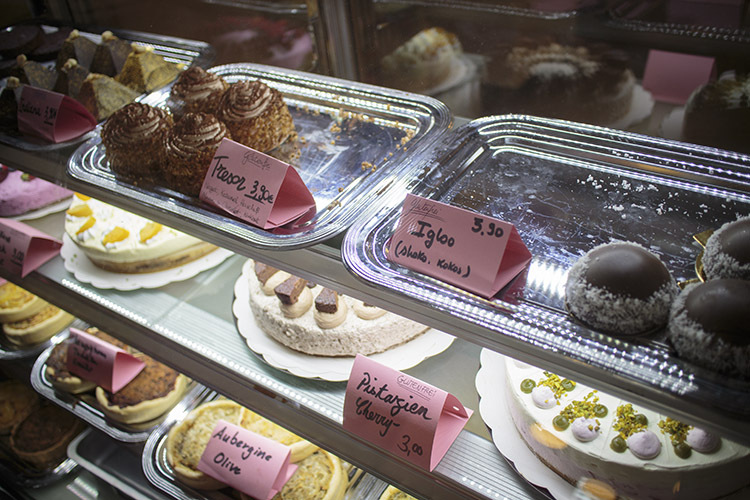 I ran in and quickly glanced over all of the cake options on display. They all looked absolutely amazing but none had a gluten free label on them!! How could this be! I sat down at a table in despair and checked the menu. On special order. Damn! But, after a quick chat with the friendly staff, they assured me they did have a Gluten Free cake in the back. Joy! I asked them to bring me a slice as soon as they could. Now, whilst not what I’d call a cheesecake, it was rather delicious indeed and close enough to satiate me. 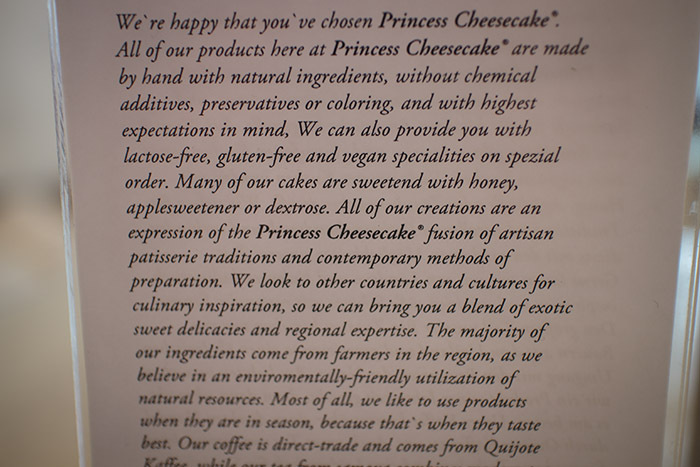 I’m going to guess that the gluten free option they have changes, so you may not get the same cake, but I hope you do. Inside, the place is a little small with limited seating. So, especially in winter, you may have to wait for a seat. In conclusion, if you’re nearby, it’s worth walking past to see if they have seats and what the gluten free cake on offer is. Although, whether it’s worth a trip just to go there is another matter, I’ve tried a few times and been unable to get a seat.